Safavieh Hand-hooked Nautical Blue Wool Rug - 5'3" x 8'3"
The Chelsea Collection of hand-hooked contemporary rugs feature timeless looks from a pure virgin wool pile providing comfort and softness to the touch made from an all-natural material. Hand-surged binding and 100 percent cotton canvas backing adds to the durability of your rug to be enjoyed for many years. The fringeless borders give a very clean, elegant look and feel. Great rug. Colors are true to what is displayed online. Using under office chair at home. Would consider a larger size next time. 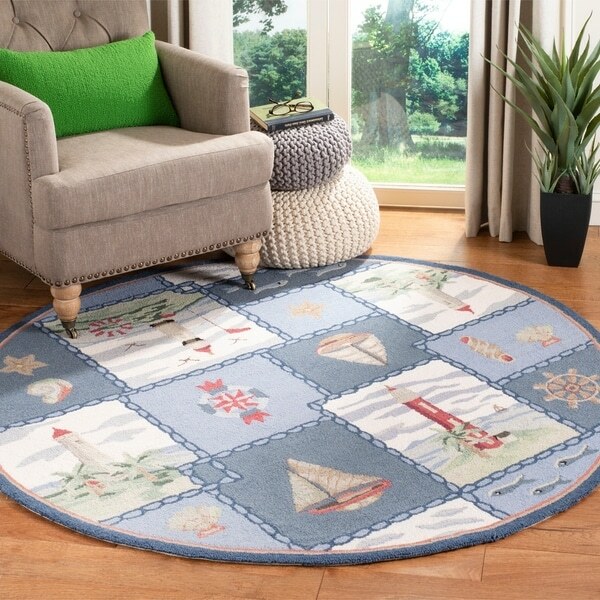 I ordered this rug to match nautical accessory pieces, including shell collection. It exceeded my expectations as a decoratioin piece. I will not place the rug on a high traffic area,because I do not know how it would maintain its appearance. I tried to order a matching rug in a different shape to go on another area in the same room, but there were no more in stock. This rug looks much more expensive than it is. I will be using it in a River-front Property on top of a wooden blanket chest that needs protection. The nautical scenes will be lovely in a nautical bedroom that we are putting together from where the house was recently remodeled. I am pleased I chose this rug. Getting the discount made it all even better. This is an incredibly nice rug. Very nicely-made and very soft. I'm very happy with my purchase. Safavieh Hand-hooked Nautical Blue Wool Rug - 3'9" x 5'9"